Looking for a delicious and easy way to dress up sweet potatoes? 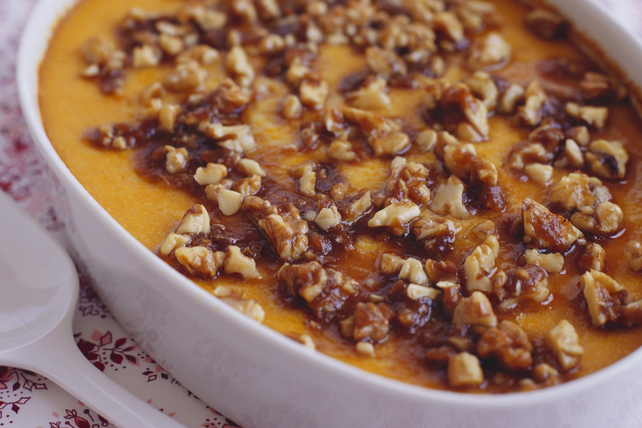 You'll want to try our Sweet Potato Casserole with Pecan Topping. Mashed sweet potatoes are combined with cream cheese, topped with a sprinkling of brown sugar and pecans, then then baked in the oven until hot and bubbly. Cook potatoes in boiling water in large saucepan 15 to 20 min. or until tender. Heat oven to 350°F. Drain potatoes; return to pan. Add cream cheese product and Parmesan; mash until smooth. Stir in milk. Spoon into 13x9-inch baking dish sprayed with cooking spray; top with sugar and nuts. Bake 25 min. or until heated through. This satisfying vegetable side dish can be prepped ahead of time. Combine ingredients as directed except do not top with nuts. Refrigerate up to 24 hours. When ready to serve, sprinkle with nuts and bake as directed, increasing the baking time if necessary until casserole is heated through. Prepare using Philadelphia Light Cream Cheese Product.